The cylindrical shape is locked in the furnace at constant temperature (circa 600C) to allow the covering wax to evaporate and to eliminate the materials that have created the internal pipes within the refractory clay shell (elder wood or wax). Here the sculpture is set to rest for ten days, smaller sculptures necessitate less time and are taken out after a week. The wax leaves the hollow space that will later be occupied by the liquid metal. 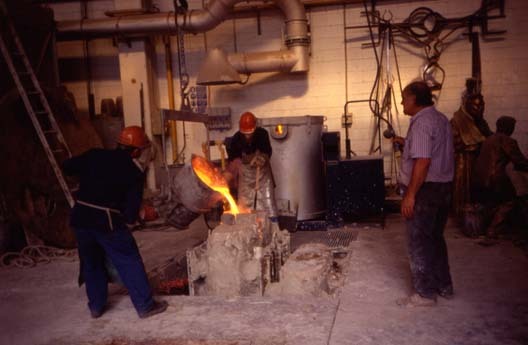 When the sculpture is ready to receive the molten metal, the incandescent bronze is poured over from the crucible into the ladle – a huge metal bucket – and from this into the mouth of the structure of melt channels. The collocation of the pipes that transport metal, at the Fonderia Artistica Mapelli, is planned in a way that does not allow the molten bronze, once channelled, to touch directly the surface of the artwork, rather piling up at the base of the cylinder and slowly climbing to the top of the sculpture, occupying the space left by the evaporated wax. This methodology – more time consuming and complex in comparison to the one of releasing the metal directly on to the sculpture surface – guarantees a higher quality and greater neatness in the final product. The operation must be carried out with extreme care and great skill, as it is easy to generate air bubbles and difficult to make sure that the surface is covered homogeneously. This methodology also makes sure that no residual refractory clay remains trapped under the artwork surface: in fact, the clay has a lower specific weight to that of the metal, hence remaining afloat when the molten bronze flows. This makes sure that the sculpture surface is not dented by this residual, hence avoiding imperfections to later rectify.